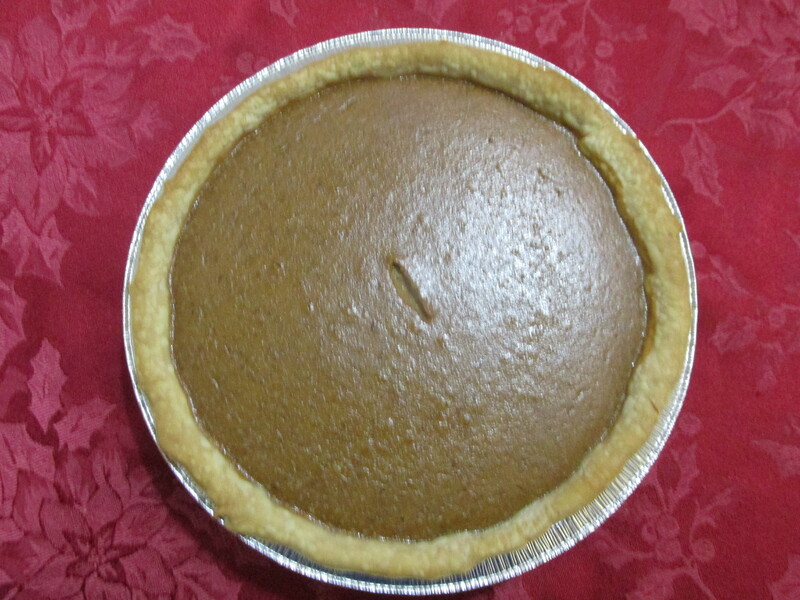 My mother made the best pumpkin pie when I was a little girl. Thankfully she shared her recipe—and her secrets—with me. Mix eggs, pumpkin, and spices in the order given. I’m never stingy with the cinnamon in this recipe, making it a heaping teaspoon or almost doubling the amount required just as my mother did. Another secret she had was adding a teaspoon of Pumpkin Pie Spice. This is a blend of cinnamon, ginger, cloves, nutmeg, and allspice. Though this is completely optional, it rounds out the flavor of the pie. Stir together and mix pumpkin with all the spices before adding the last ingredient, a can of evaporated milk. Stir this together until blended and pour into an unbaked pie shell. Bake in preheated 425-degree oven for 15 minutes. Reduce the temperature to 350 degrees and continue baking 45 minutes or until a knife inserted in the pie comes out clean. Let it cool before slicing. May garnish with whipped cream. Doubling this recipe makes 3 9-inch pies. My daughter now makes “Grandma’s” pumpkin pie recipe. The torch has been passed! Hope your family enjoys this pie as much as mine does. Idaho‘s nickname is the Gem State because of the abundance of precious stones found. Opal, jade, jasper, and topaz are a few of the rare gems found there. The state gem is the star garnet. I wanted to host an old-fashioned theme party for a few friends during the Christmas season. Read Evening Amusements for Old Fashioned Themed Parties – Part 1 for food ideas. Part 2 explains the Game of Concert. Today I’m sharing two fun games. You need only your wit to play these games in a group setting. The games call for guests to think about their answers and also how they will outwit an opponent. In this game, players take turns asking the person on their right a question, which can be any number of syllables. Each word of the neighbor’s response must be one syllable; it can be a whole sentence, just every word must be one syllable. Example: Do you enjoy the winter season? Answer: Yes, I actually enjoy driving in icy conditions. Had he stopped at “yes” he would have been fine, but “actually” “enjoy” “driving” “icy” “conditions” get him booted from the game. If any word of the player’s response contains more than one syllable, that person is out. This game is similar to the Game of One Syllable. The person asks a question to the player on their left and requests the response be given without an “e” (or an a, etc.) Then every word in the response must not contain that vowel. If the player includes the forbidden vowel, he’s out. Guests enjoyed both these games so often played at parties over a century ago. Next time we will talk about more party games. Hope you can join in the fun! That’s what a family member told me even as he urged me to read this novel. The author’s constant interruptions to explain backstory and foretell future events prevented me from becoming emotionally involved for half the book. Then I became engaged and lost several hours of sleep trying to finish it. 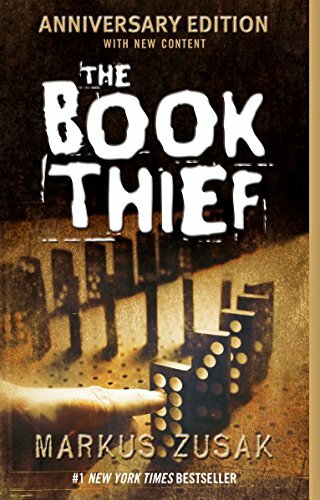 The book thief, a girl living in Germany at the time of Hitler, endures countless difficulties and suffers many losses. The power of the story strengthens and escalates toward a climax that made my heart hurt. I found a recipe for potato pudding in an 1877 cookbook, Buckeye Cookery. I’d never eaten or even heard of this type of pudding and decided to try it. The recipes in this cookbook generally leave a lot to the imagination, but ingredient measurements were given for this one. Peel six potatoes, cut into small wedges and then cook them on the stovetop. When they are soft and fork-tender, mash them finely. Separate 5 eggs and reserve 2 egg whites in another bowl. Beat egg yolks and stir into the potatoes. Add a cup of sugar and ½ cup of butter and stir well. Beat 3 of the egg whites to a stiff froth. Fold into the potato mixture. Grate one lemon rind and add this and its lemon juice and stir. Add 2 cups of milk or cream and ½ teaspoon of salt. I baked it at 350 degrees for about an hour. Then I whipped the remaining 2 egg whites with 2 tablespoons of sugar until white and fluffy. 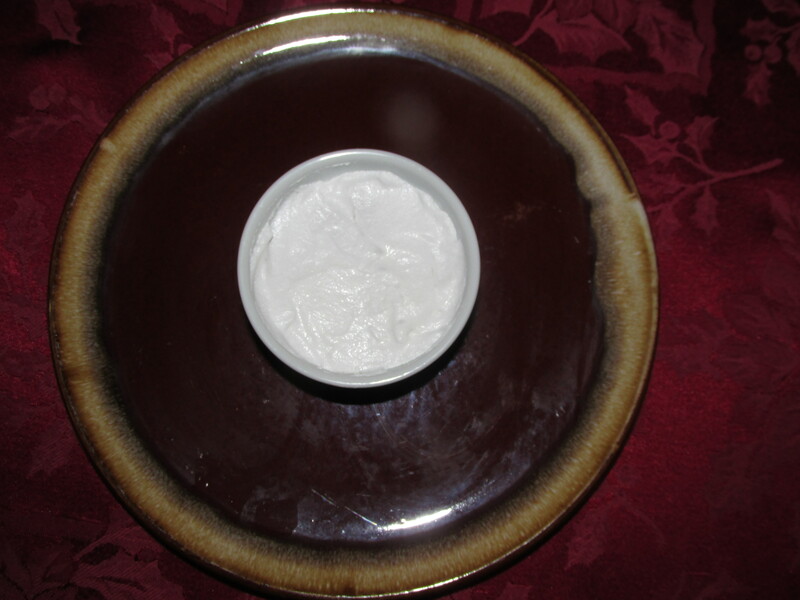 This was used as icing for the pudding. It smelled good but tasted strangely. Lemon and potatoes didn’t get along well together. I decided to remake this recipe leaving out the lemon altogether. Instead I used cinnamon and nutmeg. 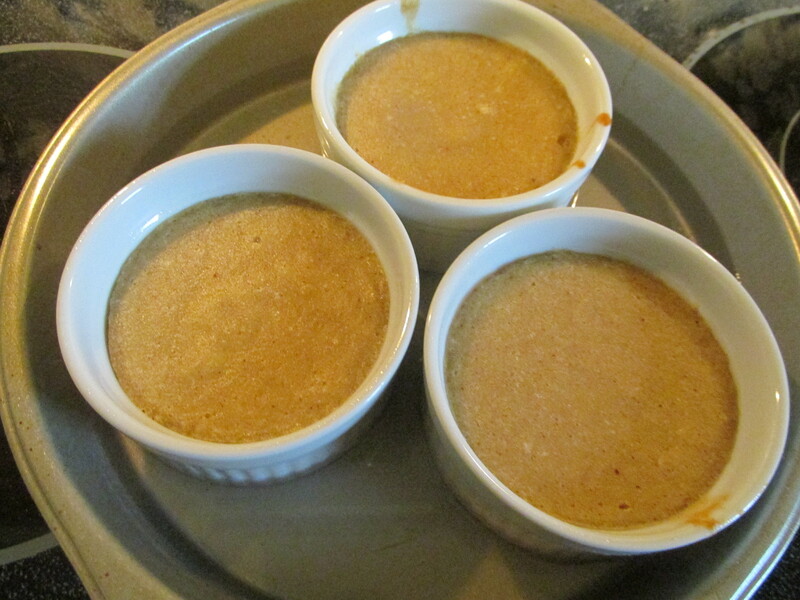 The quantities given made 6 single serving ramekins besides filling a medium baking dish. I chose to cut this down to a third of the quantities suggested. Using 2 potatoes, 2 eggs, 1/3 cup sugar, 2 tablespoons butter, 2/3 cup milk, ½ teaspoon cinnamon, ¼ teaspoon nutmeg, and ½ teaspoon salt, I omitted the lemon components and followed the recipe above. This mixture gave 5 ramekins, which were baked in a larger pan. The ramekins sat in an inch of hot water and baked in a 350-degree oven for 40 minutes. Then I whipped an egg white with a tablespoon of sugar and spread the meringue over the top. This turned out much better. I refrigerated the pudding. Chilling it improved the flavor. The original recipe is from 1877 cook, Mrs. Gov. Ingersoll from Connecticut. Novelists may sometimes find that their story stalls in the middle. 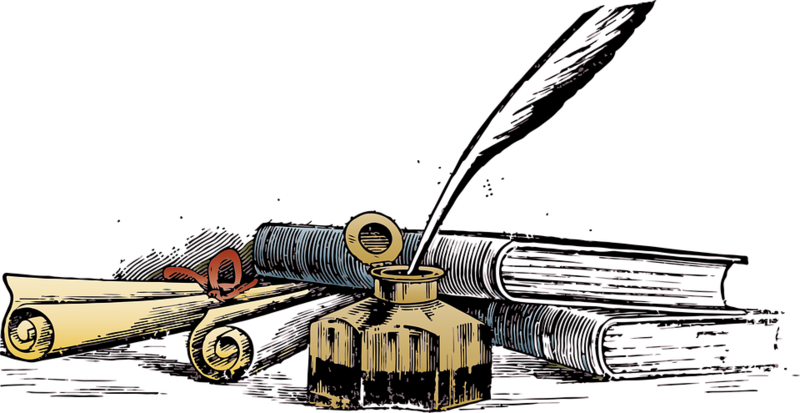 Writers of historical fiction can reap unexpected benefits from their research. To explore this ‎national park in Texas, take a desert hike (choose from short and easy walks to longer ones requiring several days), forested mountain hikes, or short river walks. This park is especially nice for bird lovers! I wanted to host an old-fashioned theme party for a few friends during the Christmas season. Read Evening Amusements for Old Fashioned Themed Parties – Part 1 for food ideas. The local library contained a book written in the 1880s on evening entertainments filled with various games, card tricks, forfeits, and even chemical surprises. I thought others might enjoy planning this type of evening so I’m sharing games we played with you. Elect a conductor who will lead an imaginary orchestra. 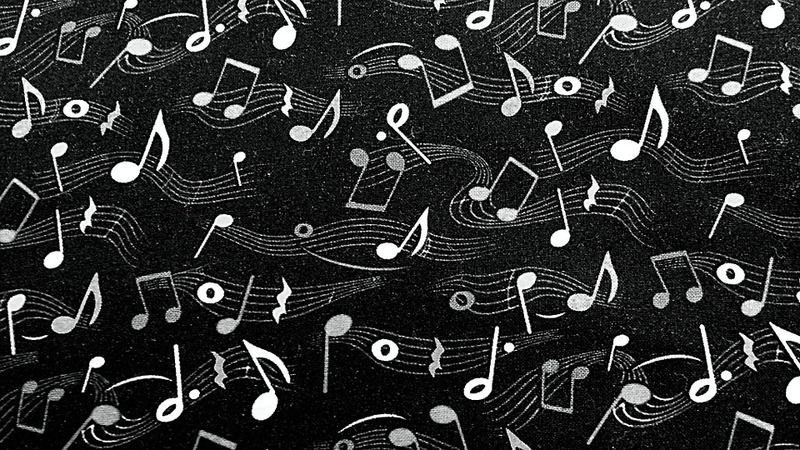 Assign instruments, such as violin, harp, drum, trumpet, trombone, flute, cymbals, clarinet, tuba, bugle, fife, bass, etc. Conductor hums a tune and all join in noisily using their pretend instruments. The conductor waves imaginary baton and everyone ceases. Time for “solos.” Conductor makes motions to play a particular instrument. The person who has that instrument immediately joins in and pretends to play. If they don’t, they are out of the game. Conductor continues with solos until everyone has played. Historically, contestants earned forfeits for losing that were “paid” at the end of the evening. For our purposes, continue playing until only one player remains who claims the prize. One of our guests had attended college to become a band leader but never found a job in that field. How fun to find out that tidbit early in the evening and be able to elect him as conductor! He had to speed up to catch “band members” off guard. He did such a great job that everyone agreed that he won the prize. My grandmother made stack cakes every year at Christmas when I was little. She was an excellent cook and baker but wasn’t blessed with enough patience to teach her daughters and granddaughters how to make them. She never measured anything. Cakes, biscuits, and pies were all made by sight and touch. She held salt in her hand to know how much to add. She rarely guessed wrong. Unfortunately, she shooed us from the kitchen if we asked too many questions about how to make something. We tried to observe quietly but it was difficult to learn how to cook that way. When she died, I feared that her wonderful recipe was gone forever. 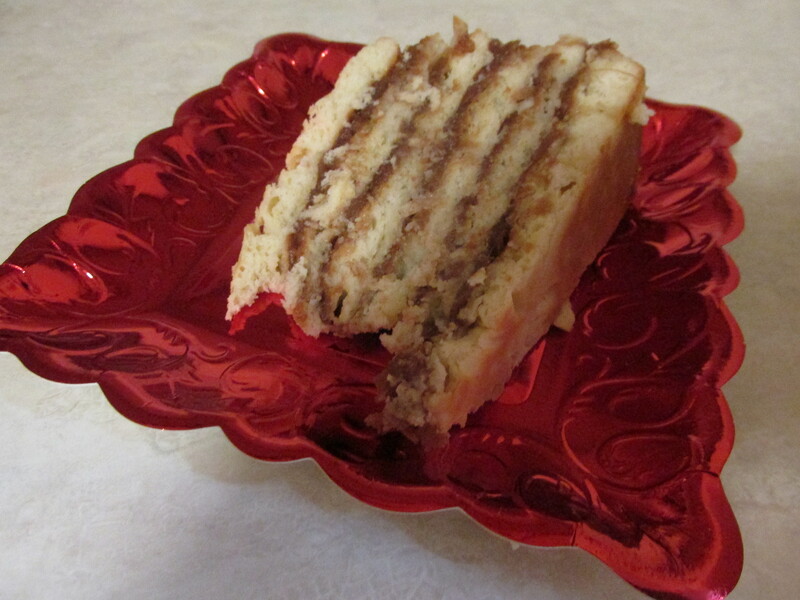 I tried to make it from memory and came fairly close on the apple filling but not the cake layers. I remembered them being thin, like a big soft cookie. Both my sister and I found the recipe while visiting the Smokies. 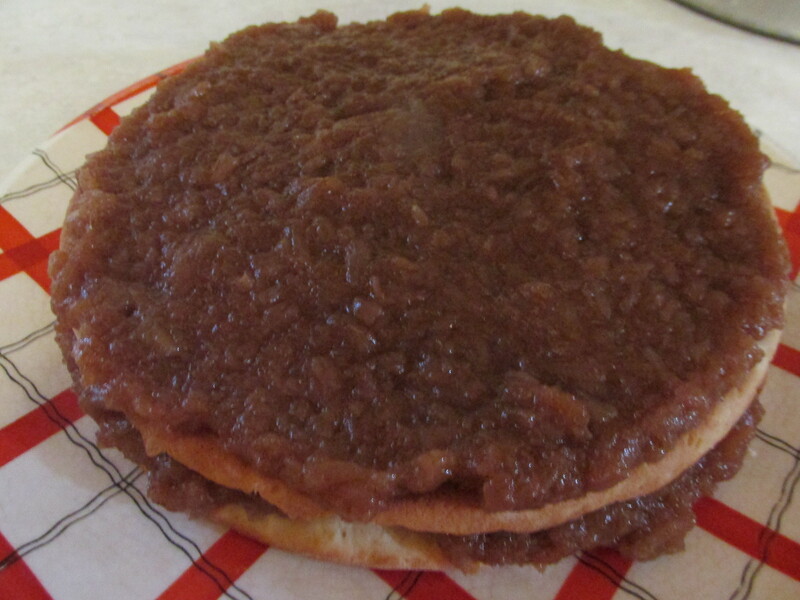 Arrange a pound of dried tart apples in a large kettle. 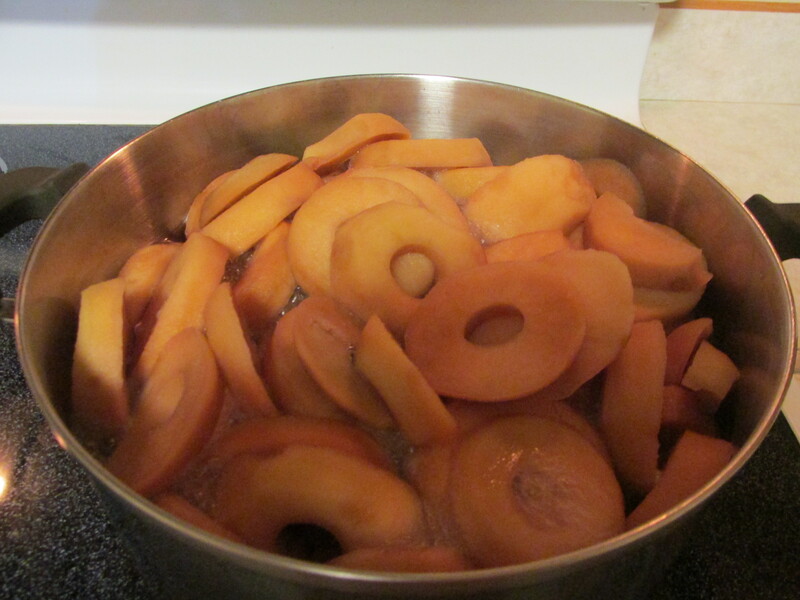 Cover the apples with boiling water to soften. This make take a few hours or allow to sit overnight. I drained this water but I’m not sure it’s necessary. 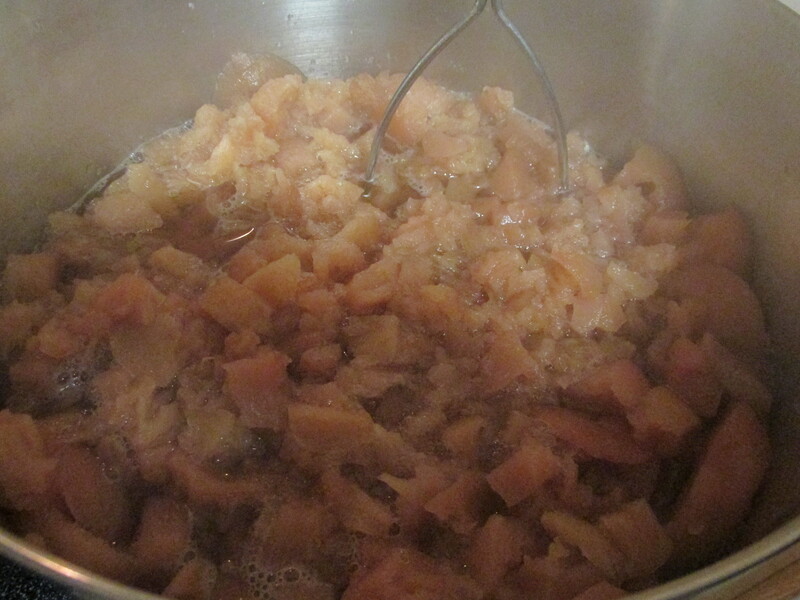 Add enough water to almost cover the apples and cook over medium low heat about an hour or until tender. Drain almost all the water from the cooked apples and then mash. I kept about a cup of water in the pot with the fruit. 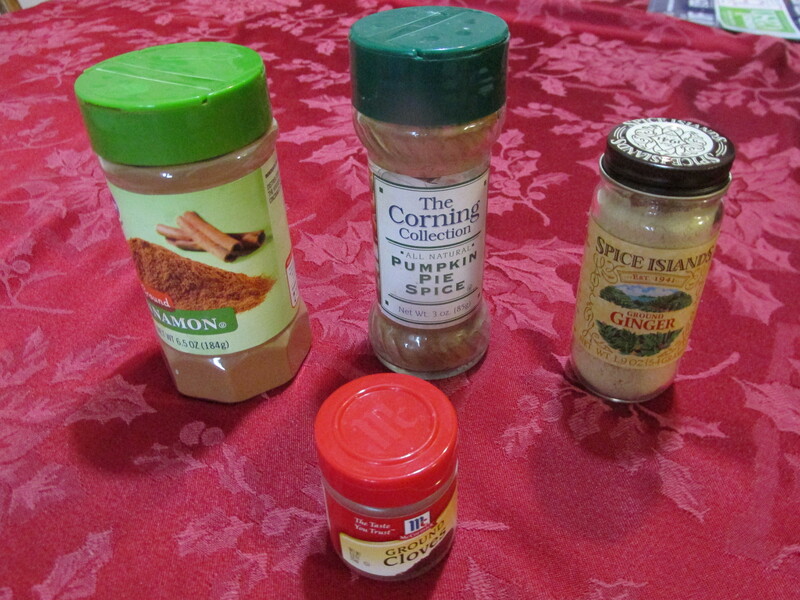 Add a cup of brown sugar, ¾ cup sugar, 3 teaspoons cinnamon, ½ teaspoon ground cloves, ½ teaspoon allspice, and stir well. Sift 3 ¾ cups all-purpose flour into a medium bowl. Add a cup of sugar, 4 teaspoons baking powder, ½ teaspoon baking soda, and 1 teaspoon salt. Mix together. Beat two eggs in separate bowl and add to flour mixture. Then add a ½ cup soft butter, a cup of buttermilk, and 2 teaspoons of vanilla. The instructions suggested baking in a 450-degree oven but I baked at 425 until lightly brown, about 11 to 12 minutes. 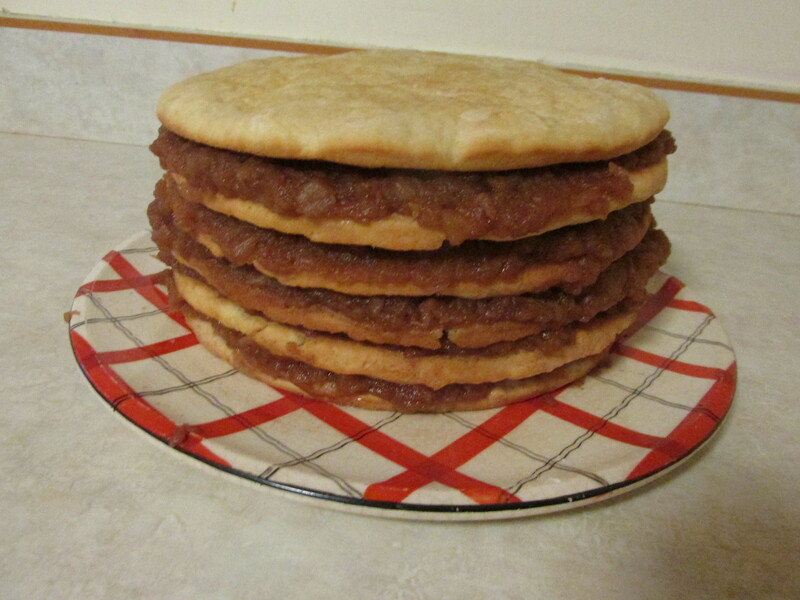 Spread each layer with the apple filling except the top layer. Cover and store at least half a day before serving. My grandmother wrapped her cake in plastic wrap. Then she covered them with towels and stored them in a cool place about two days before slicing. I did the same in her honor. My guests enjoyed the cake. It felt good to carry on my grandmother’s tradition. The Tates. Hillbilly Cookin, C & F Sales, Inc., 1968. Colonists in South Carolina didn’t all support seeking independence from Great Britain until the British attacked Charleston.